Dr. 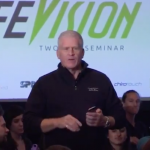 Guy Riekeman closes LIFE Vision with a bang, as usual. He speaks about intention and brings everyone together one last time before he sends us off back to school, back to our offices, and our homes, to change the world. Get a sense of coming together as colleagues to remove interference to expressing our own potential as a profession. Dr. Guy F. Riekeman is the president of Life University in Marietta, Georgia. He brings an uplifting vision and a wealth of practical experience to this critical leadership position, consistently demonstrating a unique ability to articulate meaning and inspire discipline for far-reaching success. Dr. Riekeman obtained his chiropractic degree in 1972 from Palmer College of Chiropractic. He created companies and seminar programs to improve chiropractic practice and facilitate personal growth. Quest, founded in 1987, became one of the most acclaimed of such enterprises, helping doctors worldwide with both business and patient care. Dr. Riekeman is a highly sought motivational speaker.